XFX RX 580 GTS Black Edition - is this normal ?! Discussion in 'Videocards - AMD Radeon' started by bernek, Jul 21, 2018. My Inno3D 1060 6GB passed away and I decided to go full team RED and bought an XFX RX 580 GTS Black Edition card ... mainly is 1405 or 1450 on the clock and 2000 MHz memory (I guess this is standard). I used DDU in safe mode then installed the latest Adrenalin Edition driver from amd.com after installing the video card of course. I ran a few games (Conan Exiles, GTA5, etc) and the fans are LOUD (compared to 1060 6GB) they ran at 2200 rpm from a maximum of 3500 rpm ... (two fans pretty sturdy construction). The temperature reported from the Andrenalin OSD - I used CTRL+SHIFT+O to enable the OSD was between 80-90 degrees Celsius ... most of the time it was between 80 and 85 and it had spikes (in Conan Exiles) towards 87-88 maybe at some point it hit 90 degrees. Also the card is factory overclocked and I didn't OC the card anymore it was all default. When I launch a game the temp ramp up towards 80C very fast and so does the fan. (fan goes to 65% and 2200 rpm) so it's not at max but still ?! I haven't had a modern ATI/AMD card since my R9 270X DirectCU2 from ASUS that was much quieter. So my concern regarding the XFX RX580: are the temperatures normal ? is it supposed to be this loud ? Try to help me out guys I'm a bit puzzled. P.S. I have 4 case fans and all the rest CPU / Mobo doesn't have any heating issue. (case is Phanteks P300 - quite small). What i know, most of RX 580 could downclock after reaching 80°C on stock. I will double check with GPU-Z sensors tab running background but I'm pretty sure the temps are correct. P.S. just ran Unigine Superposition (High preset) and max temp was 87 degrees C. It downclocked maybe 5-10 MHz from 1405 towards 1395 and it was fluctuating betwen 1395 and 1405. Temps seems to be too high on that RPM. Do custom fan curves. Just a little tweak. Maybe some super intelligent fan system, something like IFC on Sapphire is faulty and one of the fans spins slower. PS: Yes, Intelligent Fan Control is useless on my Fury, causing throttling only. You recommend I use Wattman or MSI Afterburner for a custom fan profile ? So far I've played a few games and in DX12 the performance is SOLID. I wasn't getting this kind of smoothness and peformance from the 1060 6GB in DX12 titles. I love the consistency it has. (usually new version of Afterburner solved problem). Glad to hear you see improvement. Really happy ! I undervolted the card by 50mV and temps dropped even further now I'm gaming at the stock (factory OC) clocks with little to no throttling at bellow 80 degrees Celsius and a modest fan speed between 2100-2200 rpm. I have an old collection of games but the performance is really nice compared to the 1060 that died on me and no it's not placebo effect ! I still have 10-15 games to test but I'm not a fps freak I'm looking for 60 fps and smooth gameplay no shuttering/lag etc and this card is better. Benchmarks say that is 50-50 but this card is better at least combined with the Ryzen 5 2600 for me it offers more stable and higher performance I don't understand why in benchmarks its slower on some cases. 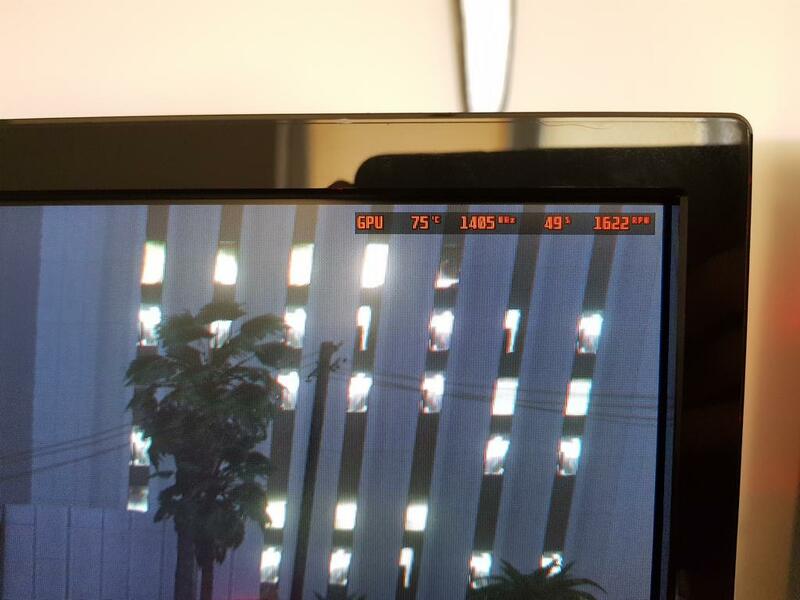 About GTA V. Radeons always did worse here, specially when you have AMD CPU, but you can tweak your settings to have good image quality and performance. I also playing GTA V on mixed High/Very High. Some setting on ultra cause worthless quality for great performance hit. You can see where it is more white-ish in color its totaly dried out where is darker grey is "ok" but its thermal conductivity is somewhat poor. Half of the thermal compound was dry and half was standing on other SMD parts that didn't require it ... the thermal pads were in good condition (didn't change them) not sure how much thermal conductivity they have but I said let's give them another chance since they can be changed at a later time. I used Arctic MX4 (doesn't conduct electricity - I use this because if you put to much AS5 for example or any metal liquid new gen stuff you might make a short cirtcuit and goodbye GPU). I prefer the MX4 for this sole reason. The temps were dropped 15 degrees Celsius under load I've checked from before and after. This is not a post to prove anything and I'm not bragging about the acomplishment so please excuse the limited photos and explanation. 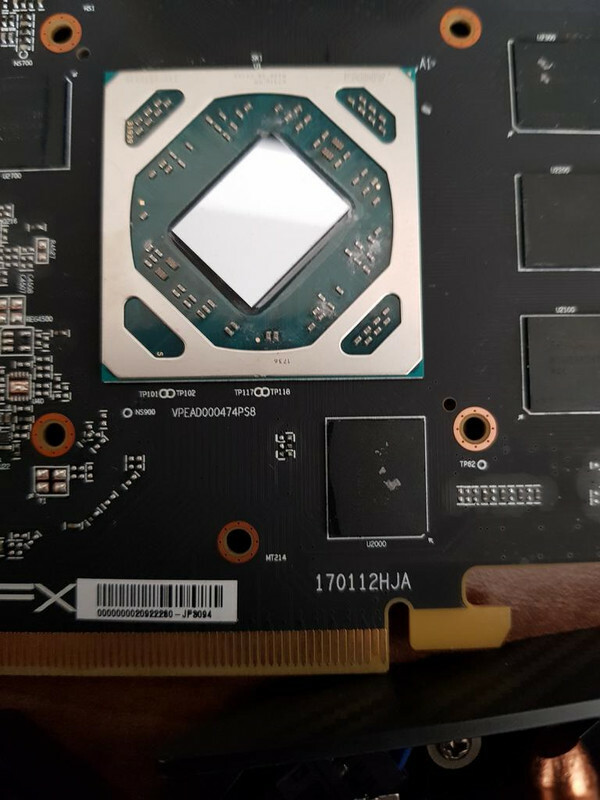 This just wants to point out that factory thermal compound at least from this company (XFX) is trown on the gpu in large amounts and its quality is very poor since the card is almost new and the compound was dried out. Gapster and z8373767 like this. 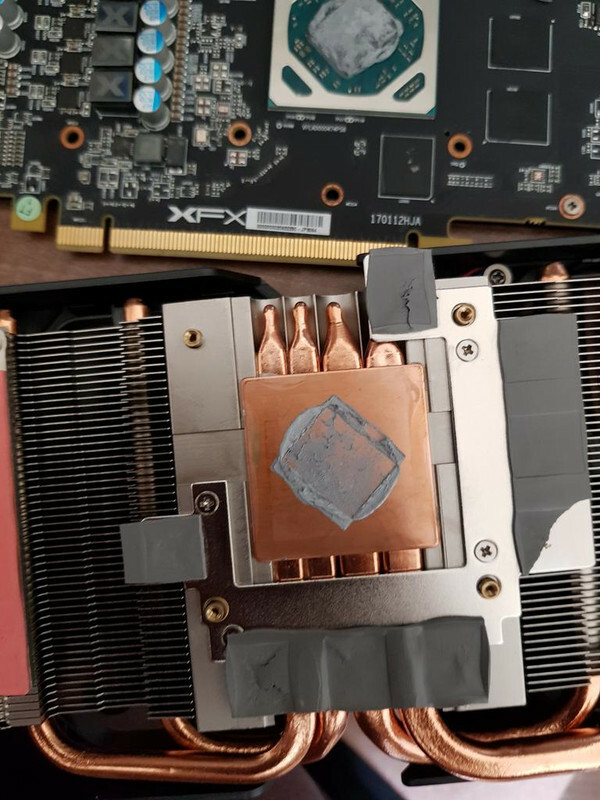 Why did a well known company life XFX use that cheap thermal compound ? When it's a good card and its their top tier GTS Black Edition whatever and so on. My friend had almost same case. Have fun with your GPU. 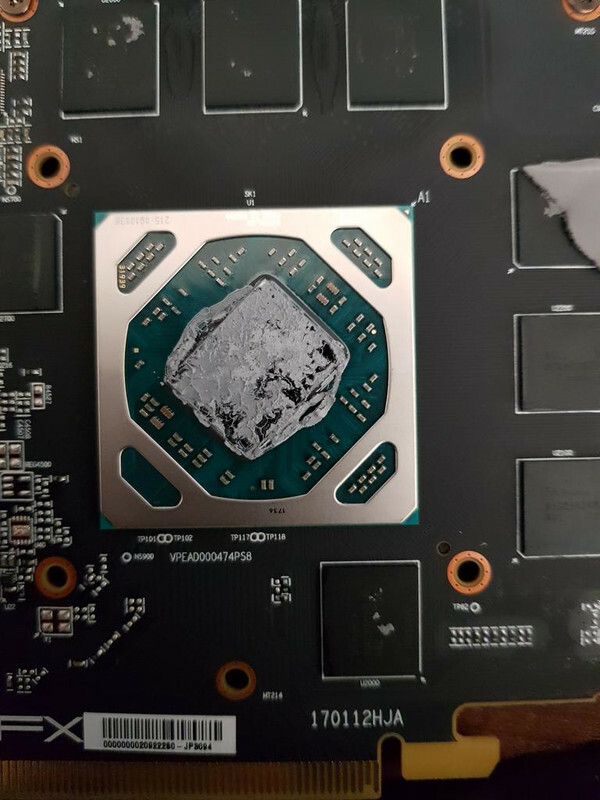 What GPU was it ? Mass production + cost reduction, basicly the same reason Intel stopped soldering CPU's and heatspreader to save that little bit of cash. Went to LM today and I'm really happy with the results ! Some photos during the installation. 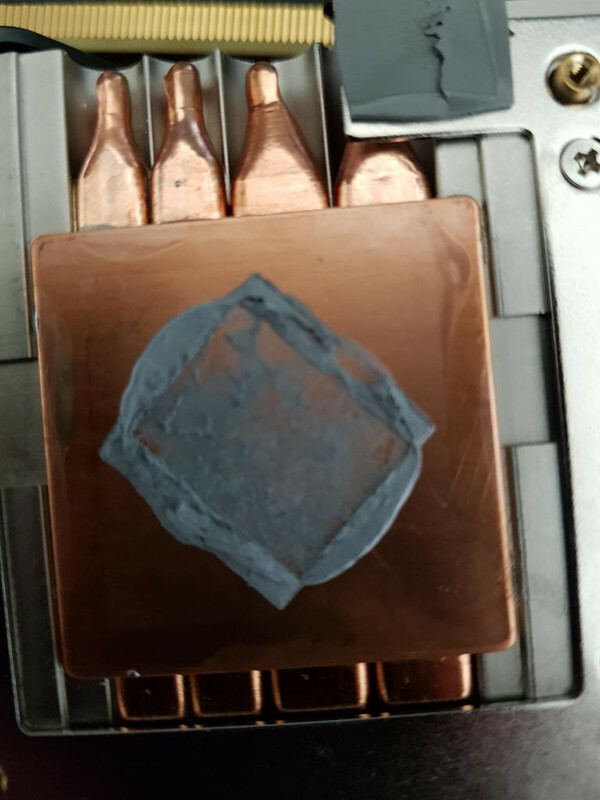 I used UV nail polish to "paint" the condenser and resistors near the GPU die to make sure even if some LM reaches there it wont short-circuit anything ... It was a more of precaution instead of a requirement but I decided to take it. The temp before (Arctic MX4) were 86-87 in Valley Extreme HD Preset for 10 minutes and after they were 75-76 degrees Celsius in Valley Extreme HD Preset. The target temperature being 76 degrees that means the fan was only spinning at 1800 rpm compared to full (allowed) speed from before which was 2200 rpm. (The fan maximum RPM is ~ 3100 completely unbearable noise at that rpm). So my findings were that LM (Thermak Grizzly Conductonaut) lowered the temp at regular/normal usage by more than 10 degrees Celsius and if I would tested with 100% fan speed they would have been even better so it can reduce temps in 10-15 degrees Celsius depending on load/fan speed. I wasn't interested in testing at full speed to get the actual difference that LM makes because it wan't my case. I was looking for a cool and SILENT card so I got what I was dreaming for. P.S. The before tests were made with Arctic MX4 not the original crappy half dried thermal compound that was throttling the card all the time. My Aorus RX 580 XTR never goes higher than 70 and 1450 RPM. I've never touched the thermal compound. Strange that XFX went with sooooooo bad quality. Can you please share clocks and voltages ? 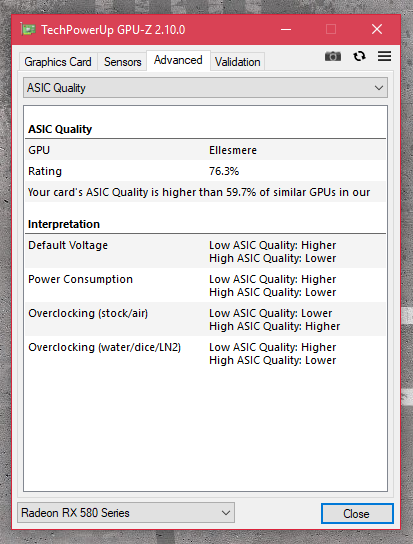 Also ASIC Quality would be nice ! I had to go Liquid Metal cooling to get closer to your temps and you have 1431 on boost clock. Always working with 1425 mhz (1.200V) on core and 2000 mhz on vram. I don't use wattman - standard settings. Thanks for the pics ... In wattman are you sure the volts are 1.2 for the last 3-4 Pstates ? @bernek , temps aren't directly comparable to other people's cards. You have to factor in ambient temperature, airflow, etc.